You have probably heard about the numerous benefits of Coconut oil, but do you know that coconut water also has a magical effect on some of our Chakras? 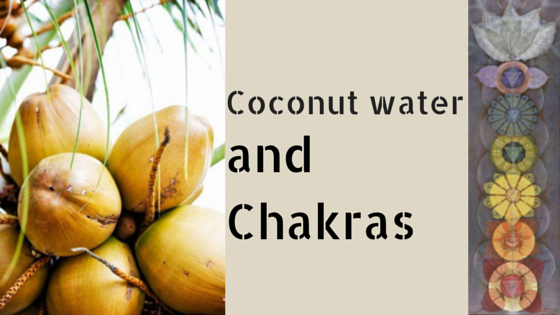 Coconut water corrects, balances and improves t functions of the lower three Chakras. Coconut water is not just a refreshing health drink to beat the summer thirst, but also a simple way to balance the lower Chakras. Ideally take one serving of Coconut water every day. Coconut water contains electrolytes, good for body and boosts Hydration. One Serving of Coconut water has only 46 calories and has 2 gms of proteins which helps repair and build the body tissues and cells. It also helps you loose weight and doesn’t have fat or transfats. But do not eat the PULP it has high sugar and FAT. It has saturated fats to keep your skin, hair and nails healthy. Since it has high levels of potassium it prevents muscle cramping. Coconut water is a natural diuretic,boon for people suffering with kidney stones or kidney problems. Because of the presence of Potassium, It not only dissolves kidney stones but also prevents their formation. It has dietary fibre 3 gms which helps in BOWEL movement, keeps your digestive tract and Intestines healthy. Coconut water is rich in Magnesium and Potassium and when Consumed every morning empty stomach will correct LOW blood pressure. Research studies suggest that cytokinins (e.g., kinetin and trans-zeatin) in coconut water found to have significant anti-ageing, anti-carcinogenic, and anti-thrombotic (anti-clot formation) effects. Now that you know how Coconut water influences your chakras, drink it and feel the difference. Please share your comments below. Disclaimer : I do not have any sales or distribution rights of Coconuts :-), nor I am associated with any of the companies that deal with Coconuts.